As litigious as Komen has proven itself, I’m a little amazed they have not gone after a band calling itself The Cure. Never mind the fact The Cure put out their first record in the late 70s, well before Komen existed, would that matter? Komen seems to think they own the words, and indeed have trademarked the phrase. Ugh, I hope I’m not giving them any ideas. Let this be a warning Komen, if you ever go after The Cure I will not rest until I see your utter annihilation. Yes, I love that old band that much. My biggest form of therapy in this post-treatment life has been music, as I’ve mentioned in several posts. I’m lucky that deep in the heart of Pinktober, The Rock And Roll Hall of Fame announces their nominees for the following year’s induction ceremony. It gives me a much needed distraction when even my beloved Halloween pumpkins have been painted dreadful pink (see this old post). Yes, it’s silly an old alterna-girl should care if a band that was not “popular” back in the day should get into an institution; I mean punk/indie music was about rebelling against institutionalized rock. I wrote about this a couple of years ago in the post I’m In Love With That Song. So this is my plea to those who vote or have a hand in the nominees for The Rock and Roll Hall of Fame for this October. (Questlove? Maybe you can do this for me?) Please nominate The Cure again. As a breast Cancer Curmudgeon, I am so sick of the rah-rah, the pink madness of the month and everything associated with Komen’s greedy possession of the phrase The Cure. That is not to say I don’t want a cure for cancer—don’t be absurd, of course I do. I’m just still stuck in this place I’ve been all summer where practically ANY word or phrase in the world of cancer drives me nuts (empowered, powerful, journey, fight, battle, just…ALL OF IT). Please let me have The Cure, the band, back. 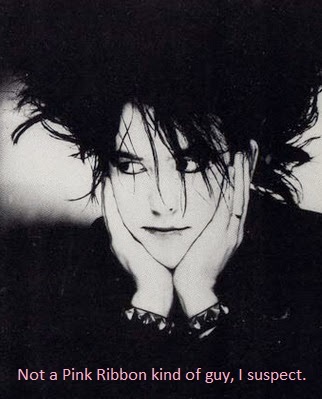 I want to talk about The Cure again and mean music, not overused phrases. Robert Smith and the gang may not be the cure I need if I get a recurrence, but they are a Cure for the nonsense I can barely tolerate in CancerLand these days. Can we vote? I would *totally* vote for The Cure! Actually you can vote but only after the nominations are declared. The RRHOF website has a page where the average person can vote for 5 artists. You can vote every day–believe me, I’ve done that. But it only counts for a small percentage. So, it only depends on if The Cure get nominated for the second time. And yes I will vote every damn day! First of all, I love The Cure!! The weird thing just happened. As I was reading this post, a song by The Cure came on, “close to me”. Two of my favorite songs by them are ” a forest” and “boys don’t cry”. Of course there are many others. Do you have favorites? I enjoy rock music from the 80’s a lot and listen to it everyday. My youtube history consists of practically all songs from the 80’s. I did not know Komen trademarked the phrase, “the cure”. I would be one to go after them if they go after the band. I think many people would be VERY upset about that. Whew synchronicity! I have a hard time picking favorites of anything (books, movies, songs). I have been playing Pictures of You quite a bit lately, but it is not my fave–even my fave of that album (I love Fascination St). Oh well, I go thru phases like that with all kinds of songs. Oh how I miss 80s videos. I follow 120 minutes (that old MTV show) on tumblr and they’re good about digging up old gems that I forgot I loved. Great to watch Dead Milkmen’s Punk Rock Girl video, which is funny, the other day. I think komen trademarked “for the cure”, as in walk, run, fly a kite or whatever, for the cure. I generally avoid the phrase of course. The did sue some small charity for a small event for another cancer at least once, and I think there’ve been some other run-ins over the years. Chemobrain fog has written about those quite a bit. So The Cure, as a band, are probably safe, but skate on thin ice, ha ha. Either way, I’m just anxious to get back to talking about the cure in music, while not ignoring the need for cancer cures of course. 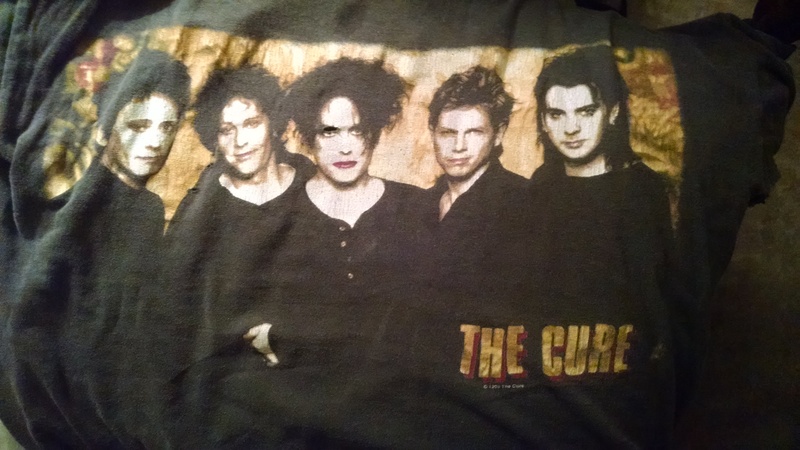 I guess I’m an old f@rt, never heard of The Cure, rock band before your post. But, I had to chuckle that you are already putting on the armor, readying yourself for this coming Pinktober. You go girl!! Ha ha, my 69 year old mom enjoys their music! But they didn’t have big hits on the radio or anything. They were more indie/college radio in the 80s, before Nirvana brought that kind of music into the spotlight in 1991. Not that they really sound the same–they don’t. Just that both kinds of music were NOT mainstream. But the good news is I found myself kind of looking forward with curiosity to the October announcement of nominees, along with my usual happiness for Halloween. And together, those things are overpowering the dread of the pink, and that is VERY good. Ha ha thanks! So pleased many people “got” this post, even tho’ it is about an old band that were never that popular or anything. YEAH!! Totally with you on this. I’ve written a few blistering posts about Komen & their ‘Suing for the Cure’ BS. They better not touch The Cure! Wow, checked out your older post, too. The Cure, The Replacements (love them! ), Nirvana….of course, you know I’ve done a few song parodies about breast cancer. It was inevitable. Maybe we could start a punk rock band ourselves….